Who are the most loved and hated Premier League managers on Twitter? A new study by BetVictor has explored football fan conversations on Twitter to discover the most and least popular Premier League managers. The research shows Premier League newcomers Slaviša Jokanovic (Fulham) and Nuno Espírito Santo (Wolves) have fans the happiest, ranking above Manchester City manager Pep Guardiola and Chelsea boss Maurizio Sarri. Cardiff boss Neil Warnock is the most angrily tweeted about manager, followed by Unai Emery of Arsenal. So far into the 2018/19 season, Jose Mourinho has almost as many tweets as all the other Premier League managers combined (582,853 vs 663,602). They say football is a game of opinions, but which managers are doing the best job in pleasing their fanbase? Using AI to really understand the sentiment and emotion behind fan posts online, Most Talked About Managers by BetVictor analyses the 2017/18 and the 2018/19 season so far, to find out. Fulham fans are loving life under Jokanovic. Of tweets containing emotion, he brings the most happiness to his club’s fans with 68 per cent of all tweets being joyous. He is closely followed by Nuno (66 per cent), Watford manager Javi Gracia (60 per cent) and Guardiola (51 per cent). Brighton manager Chris Hughton is in 11th place, with 36 per cent of tweets being joyous. Sarri tops the list for positive tweets, with 32 per cent, ahead of Guardiola (30 per cent) and Jokanovic (28 per cent). 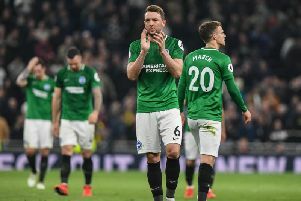 Hughton is fifth with 22 per cent. Newcastle boss Rafael Benitez has received the most negative tweets so far this season, with 27 per cent, ahead of Mourinho (19 per cent) and Tottenham manager Mauricio Pochettino (18 per cent). The unfortunate manager that has fans the angriest is Neil Warnock of Cardiff City. Given his recent comments on Aaron Ramsey, his team's disappointing start to the season and direct style of play, his place at the top (29% of all tweets being angry) isn’t so surprising. Arsenal's Emery is second, with 27 per cent of emotional tweets classified as angry. Following his team’s slow start and intense speculation that he will be replaced by Zinedine Zidane, Mourinho is the most talked about manager of the 2018/19 season with 582,853 posts to date. Such is the speculation surrounding the current Manchester United boss, that he currently experiences 298 per cent more tweets than second placed Unai Emery - currently on 146,600 tweets. Completing the top four for the most talked about managers are Jurgen Klopp and Sarri, with 128,630 and 121,405 tweets respectively. Over the course of the 2017/18 season, BetVictor's analysis revealed there were 13,740,485 tweets concerning Premier League managers. The manager with the most twitter volume? That accolade goes to the former Arsenal boss, Arsene Wenger, with a total of 3,150,126 tweets. He was closely following in second place by Mourinho on 2,938,921 tweets, with third place filled by the former Chelsea boss Antonio Conte (1,936,658 tweets). The most positively tweeted about managers last year were Guardiola and Hughton on 24 per cent, followed by Benitez (21 per cent) and Conte (20%). The most negatively tweeted managers were ex-Everton boss Ronald Koeman (20 per cent - also the manager tweeted about in the most disgust), Conte (19 per cent), Benitez (15 per cent) and Mauricio Pellegrino (15 per cent). The most joyously tweeted managers were Huddersfield manager David Wagner (58 per cent), Hughton (56 per cent) Guardiola (51 per cent) Carlos Carvalhal (46 per cent). Last season's most angrily tweeted about manager was ex-Crystal Palace boss Frank De Boer, with 29 per cent. He was followed by Tony Pulis (24 per cent) Mark Hughes (24 per cent) and Jose Mourinho (24 per cent).